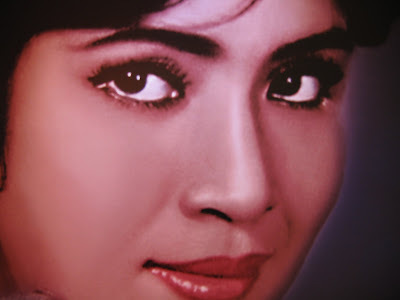 Petchara Chaowarat, the biggest-name actress in the Thai movie business in the 1960s and '70s, had her career sidelined by blindness. Legend has it that make-up to give her trademark "puppy-dog eyes" even more sparkle combined with the bright lights of film sets to take her vision. It is not easy for a famous actress to return to the limelight after so long. She told us she’s worried about being ignored because her looks have changed so much,” said Danai Derojanawong, managing director of Better Way, which owns the Mistine brand. Petchara says the comeback will be a one-off to help her charity work for the blind. Her decision was made easier when the company agreed to give a percentage of the lipstick’s sales revenue to the Thailand Association for the Blind. Better Way are making a habit of breaking records with budgets for adverts with a social conscience. Last year they spent Bt100 million on “To Be Number 1”, which tagged a drug-prevention message onto the launch of a limited-edition lipstick in a campaign that starred Princess Ubolratana Rajakanya. In addition to her TV campaign, an exhibition based on the 20 things Petchara most values in life is running at CentralWorld shopping complex in Bangkok. Tomorrow will be the first time viewers see Petchara’s face since she gave up appearing in public three decades ago. Confirming that she is still an extraordinary beauty, makeup artist Apichart Norsetthaporn says it will be the highlight of his career to work with such a screen legend. Will it really be the last time we see her? I hope not. 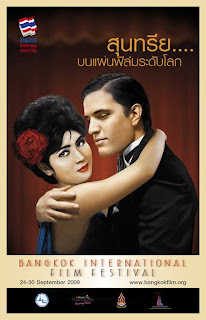 Petchara is also the face of this year's Bangkok International Film Festival. Her classic 1960s look adorns a poster designed by filmmaker and illustrator Wisit Sasanatieng. In a glamorous pose inspired by Gone with the Wind, she 's dancing or embracing with a non-specific Westerner-looking man. As part of the festival, there's an exhibition sponsored by Mistine, dedicated to Petchara in the first-floor Dazzle Zone at CentralWorld. 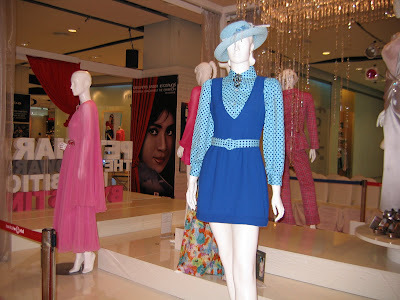 It has film posters, her awards and a dozen or so of her costumes, including swimwear and evening wear. It'll be up through October 4. Update: Here's the commercial at YouTube. In addition to a percentage of lipstick sales going to the charity, Petchara's fee, reportedly 10 million baht, is being donated to the Foundation for the Blind. Update 2: Petchara has also posed for Lips magazine. Update 3: Kong Rithdee writes about her comeback in his Saturday column. Update 4: A lengthy profile in the Bangkok Post (cache).